A few years back, BMW released the i3 and i8, two cars that — even several years on — look and feel like the future. 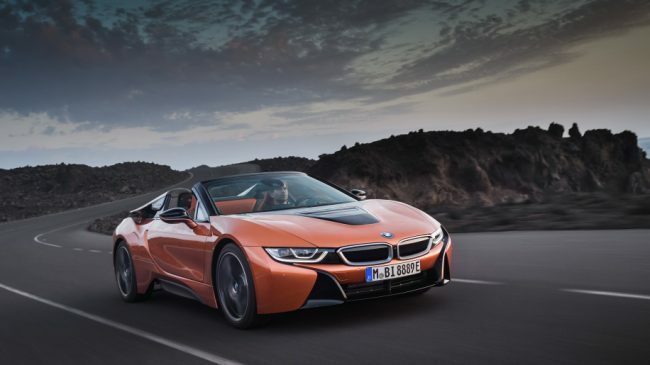 While the i3 was a car for the masses, the i8 (and this new Roadster variant) was built for those that want a performance car with some genuine green credentials and a far-out design. It’s not the fastest car on four wheels, but it is one of the most interesting. The 2019 BMW i8 Roadster isn’t cheap. It starts at $164,295 and our tester’s sole option — the $2,500 Terra World Copper package — brings the price to $166,795. It’s basically an appearance package that adds copper-colored leather seats, black brake calipers and light-up i8 badges. Yes, there are a lot of cars you can get for that money, but few will turn as many heads as this BMW. Associate Editor Reese Counts: Like the Acura NSX, the i8 is a car you can’t measure solely on performance. You have to have an appreciation for the technology and engineering that went into a car like this if you’re going to buy one. If you’re doing the horsepower-per-dollar calculations, you might as well buy something stuffed with a Hellcat engine and be done with it, because you’re sure as hell not getting much in the way of value here. That’s OK. That’s not what the i8 is all about, and not everything needs 707 horsepower and a V8 that sounds like a cocaine-addled bumblebee. Associate Editor Joel Stocksdale: Despite being four years old already, the BMW i8 is still a stunner in the looks department. It really does look like the hypercar of the future. It’s low, wide, with loads of crazy curves and cavities that give it a look all its own. I love that about it. But man, there’s not a lot else that I love about it. That’s not to say it’s a bad car, but I feel like the futuristic looks aren’t backed up by much else. The turbo three-cylinder is a growly little thing, the 30 miles of electric range are solid, and it handles well. But none of it really wows me while driving. In fact, parts of it had me furrowing my brow in confusion. For instance, the steering feels overboosted and insensitive. The bigger problem is the pricetag. The coupe starts at just under $150,000, and our roadster starts at over $160,000. And I know that it has lots of fancy carbon fiber and a plug-in hybrid powertrain, but the result is a car that underperforms compared with base Corvettes and 911s. And those both cost substantially less.